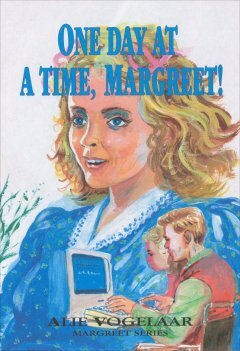 One Day At A Time, Margreet! Now spring was in the air, barely noticeable, but still it could be felt, even here where the houses were closely huddled together. There was a faint aroma fl oating in from the wide countryside outside the city, fi lling the air with expectancy for the new life that was ready to burst forth. It was even visible in the sparkling eyes of the people who were enjoying the sunshine as they fi lled the narrow streets, and on the buds of the magnolia bushes that, here and there at the corner of tiny yards defi antly opened with brilliant red splendor. It looked as if it was a carefree vacation day, and Margreet wondered if all those people suddenly had a day off. She had to chuckle. That question could be asked of her, as well. Margreet quickly walked over one of the many bridges in the city. The picturesque shape of the bridge with its rough stones was almost completely hidden behind a wide strip of parked bicycles. Even the bank along the black water of the canal was fi lled with cars of all sizes and shapes. The city center did not have much to offer in the way of natural beauty, but the unique, lively atmosphere of a university town compensated for this lack. Margreet enjoyed walking over the cobblestones and looking at the old houses, but suddenly, rounding a corner, she came into the dark shadow of an old church building that dominated the whole area. Sometimes, from behind a couple of houses, the stately Dom tower suddenly appeared, standing proudly in the full sunlight, while the rest of the city was already hiding in the long shadows of the late afternoon sun. Dark, mysterious alleyways led between the houses to some hidden corners, stirring her imagination. The sun was now setting behind the high gabled roofs, and it took along with it the glow from the water that now dark and lazily sloshed against the old bricks. The afternoon had passed quickly. Margreet had to pick up Rik at the university, where he had a meeting, but, thankfully, she did not have to be present. It was a perfect chance for her to run some quick errands. She had hurried from one shop to the other, buying only what was necessary. She looked enviously at the people strolling leisurely past the display windows and casually looking everything over to see if there was anything appealing. The best part of shopping was having lots of time for it. But that was just the problem: she usually ran out of that. The time was like a tyrant. Be here on time, there on time... and, in the meantime, do this or that. Margreet had parked their van in a handicapped parking space. Having such a van like this was convenient, because now she did not have to hunt for a parking space, which was almost impossible to fi nd in this city. Officially, Rik had to be along with her if she parked in one of those spaces, but she was not so particular, and most of the time Rik was along. She drove through the narrow streets to the suburbs of the city, where she was already quite familiar with the streets in the sprawling university complex. She parked the van near the entrance and went inside. She wondered if Rik would be ready to go. Yes, he was waiting for her in the hall. His eyes lit up when he saw her. She pushed the wheelchair through the broad doorway to the outside. Rik no longer needed to be pushed, wheelchair and all, into the van. He had now reached the point where he could stand by himself and take a big step into the van, just far enough to let himself down into the seat. Meanwhile, Margreet put the wheelchair in the back of the van and closed the door. “Okay, we’re on our way,” she said and started the engine. Margreet laughed. “I took the opportunity to rush like a whirlwind through a few stores,” she said. “What all did you need?” he asked curiously. Margreet chuckled. “Oh... you’ll see when we get home.” Now she had to keep her attention on her driving. It was late in the afternoon and rush hour had begun. She drove the van close to the door of their apartment building and helped Rik get into the wheelchair. “First I’ll open the door for you, and then I’ll get the packages out of the car,” she said. That evening, of course, she had to show Rik what she had used “all that money” for. “What else?” Rik curiously pulled another bag toward him. With a laugh, Margreet began putting away her purchases. After that, she sank into a chair, with her feet propped on another chair, and began reading the newspaper. The next day, Rik had class only in the morning. Before bringing him, Margreet hurried to straighten up the house a bit. She quickly smoothed the covers on the bed and put the dishes in the sink so at least the counter would be clean. Then she watered the plants, which were beginning to droop. “Okay.” She grabbed her jacket from a chair and pushed the wheelchair down the hallway and out to the van. It was still a little chilly outside, but the sun tried its best to warm the city from behind a thin veil of clouds. This time, Margreet went inside with Rik. It had become so customary. She sat beside him and took notes while Rik whispered to her what she should write. A lot of feeling had already come back into his hands, and he could feed himself again, but writing still was not possible. Typing did not go well yet, either, because it required too much strength. Someone had already advised him to get a computer, because a keyboard would not require as much strength. A slight touch was enough. However, their expenses were already quite high, and computers were very expensive. Margreet felt Rik’s elbow, a sign that she had to write down what the professor was saying. Oh, she had been dreaming again, which was no help for Rik. Besides, she had to write more clearly. Just think if, when she got home and had to type everything out, she could no longer read her own handwriting! Her face red from exertion, she continued writing. That afternoon, as Rik was quietly studying and Margreet, flushed from the heat, was trying to wash some laundry in a washtub, the doorbell rang. Margreet brushed aside a couple of damp curls. “That’s a good idea...” She hesitated for a moment. “But I’m in the middle of...” She pointed to the wet clothes. “Very fine. This is the busiest time for Wim in the greenhouses, you know. He doesn’t have much time for his wife right now, so I came to spend some hours with your wife.” She laughed. “As if I go shopping every day,” Margreet protested. She noticed the mischievous look in Rik’s eyes and stopped abruptly. She wouldn’t let them get the best of her. “But... how soon do you want to go?” She looked at the tub of laundry on the counter. She also had to wash the lettuce for supper... and how soon would she have to put the potatoes on the stove? It seemed as if Rik could sense all that was going through her mind. “Pick up some Chinese food for a change. That will be good,” he said and smacked his lips. “And pretty soon you’ll want to have something to drink.” Margreet looked at him a bit helplessly. Didn’t he understand that she couldn’t just get up and leave with Janet? Why hadn’t she called fi rst? Margreet freshened herself as quickly as possible in the little bathroom. Her face was still fl ushed from the steaming water, but that would fade as soon as she went outside. Her skirt was quite stained, so she changed that too. Finally a brush through her hair... She was already getting excited about going. What would Janet have to buy that was so special as to bring her to the city? It was pleasantly busy in the city. The streets were fi lled with strolling, chatting, browsing, and buying people. Margreet had to chuckle. Had she not just been here and wished she had more time to just window shop? Now she had unexpectedly gotten that opportunity, but she had fi rst made so many objections. “What’s so amusing, Margreet?” Janet asked. “Oh, I went shopping the other day, too,” Margreet said, “and then I actually felt a bit sorry for myself that I didn’t have time to just look around like other people. But you know how it goes. I had dropped Rik off at school for an hour and a half, and during that time I had to try to work through a long list of errands. I got it all fi nished, though,” she laughed. “I have a list of errands, too,” Janet said. Suddenly, Janet stood still in front of a shop window where several styles of strollers and cradles were displayed. Margreet looked at her, and suddenly she felt her throat tightening. A shock went through Margreet. “Oh, Janet...” she sighed. For a moment she did not know what to say. Janet expecting... Her head was reeling. Would that time come for her, too? They went inside the store. Margreet looked wide-eyed at everything. What beautiful cradles! Each one they saw was prettier than the one before, with yards of lace and ribbons in pastel colors. How could a person choose among such a big selection? Beyond the row of cradles was a row of cribs, which were also attractive, with matching chests of drawers. In the back of the store were shiny strollers. Janet and Margreet walked through the whole store. They quickly discovered where the price tags were. They were discreetly hidden under the mattresses. Janet and Margreet looked at each other when they saw the prices. Wow! They weren’t cheap. “Today, many people buy a crib right away,” the girl said. “At first, the mattress can be raised, and, later, it can be lowered. It’s very practical, and you can get a chest of drawers to match them.” Get one... oh, sure, thought Margreet. Janet took the brochures and thanked the store clerk warmly. “Of course, there’s a lot of work involved in furnishing the cradles. That adds to their fi nal price.” Margreet said. Toward the end of the afternoon, Janet had found everything on her shopping list, including the fabric and yardage of lace for the cradle. There was a small sidewalk cafe, with chairs outside. With a sigh, Janet set all her packages down beside her. “I really would like to start this evening already,” Janet said and stared dreamily over the water. “Janet, you have to order something first,” Margreet laughed. A waitress was standing by her, waiting. They enjoyed the hot coffee and crisp apple pie. “Hey, I wouldn’t mind being your guide again sometime for such a treat,” Margreet said. “Whenever I have another shopping list,” Janet promised. “Now and then, you really should take some time for yourself, Margreet. You need it,” Janet declared. Her thoughts went back to Wim and Janet’s wedding day. What a shock it had been when Rik had an accident right after he had brought her home. Then there had been the long wait for him to come out of a coma. Later, after many days, they fi nally had been able to talk again together. How happy they had been at fi rst, when it had looked as if everything would be all right. But then, one evening, Rik’s oldest brother, Theo, who was a pediatrician, had come to tell her that Rik was partially paralyzed. What a blow that had been! At fi rst, she could not believe it, and Rik was so discouraged. It was true, the doctor had given them some hope that for the most part it would turn out well, but he couldn’t guarantee anything. At one point, the outlook had seemed very bleak; especially when Rik had come home and could not do much else than sit and read a little if someone turned the pages for him. Then there had been the therapy, the endless therapy. He had felt like giving up and even wanted to break up with Margreet, until... the doctor had come up with the suggestion that Margreet go live with Rik. He said Rik had to begin studying again and should have someone with him at all times to be his hands and feet. He must get back to a normal routine again and fi nish his studies. When she had left the doctor’s offi ce, she had been all upset, but then she had had a long discussion with Theo and his wife, Els, with the result that she had, indeed, gone to live with Rik in order to help him continue with his studies. But fi rst they had to get married. The time before their wedding had been very special. It had been very busy, but at the same time, enjoyable. Everyone had been so helpful. And then there was the wedding... She would never forget that day. Regrets? Not for a moment. Everything had turned out well. Rik could keep up with his studies, and, thankfully, he had come out of his deep depression and despondency. She had to give up her job and her own studies, which at fi rst had not been easy. She was so attached to the children in the children’s home and wanted to help them, but, at the time, Rik had needed her help more. “Margreet, you’re dreaming. A penny for your thoughts.” Janet’s voice startled Margreet. Margreet looked at her gratefully, and Janet stood up to go. Quite a crowd of people was already standing at the bus stop. Margreet waited until the bus came and then waved to Janet, who now was visible only as a white speck behind one of the windows. At home, Rik was still busy studying. His drink and cookies had disappeared. “Did you have enough?” Margreet asked. “It was just fine, Margreet. I got a lot of work done. And... tell me something... did you have a good time? Didn’t you buy anything?” he asked in surprise when he saw her empty hands. “Oh, yes. She bought some very pretty fabric...” Margreet stopped suddenly. She looked at Rik and swallowed. Rik looked at her inquisitively. “She’s going to furnish a cradle herself,” she added. For a moment it was silent in the room. Rik continued looking at her, but Margreet was looking out the window at the wash still hanging on the line. It would be dry by now. She looked up. She couldn’t keep back a couple of big tears from suddenly rolling down her cheeks.